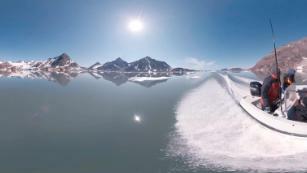 (CNN) Greenland’s largest and most critical glacier, Jakobshavn, is gaining ice, according to NASA researchers. 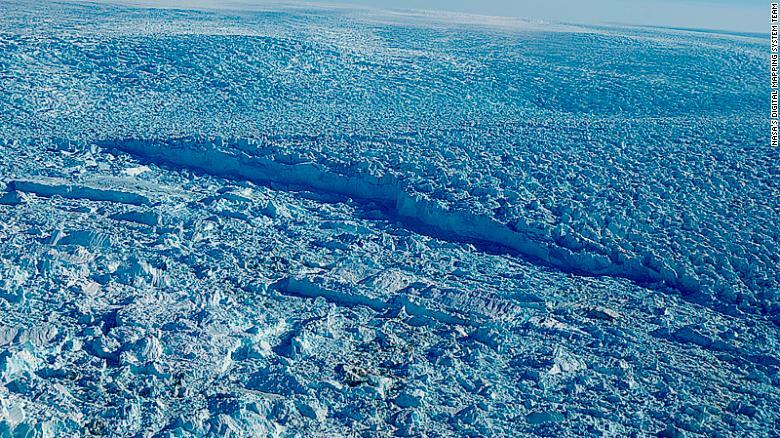 Although this finding is surprising and temporarily good news for the glacier, limiting its contribution to sea level rise, the reason for the ice accumulation might spell disaster in the long run. For two decades, Jakobshavn sustained remarkably consistent thinning that scientists thought would continue, if not accelerate, due to large-scale warming of the polar atmosphere and oceans — but that rate dramatically slowed in 2014, and the glacier actually thickened between 2016 and 2017 and again between 2017 and 2018, according to a study published Monday in the journal Nature. A close-up of the Jakobshavn glacier. 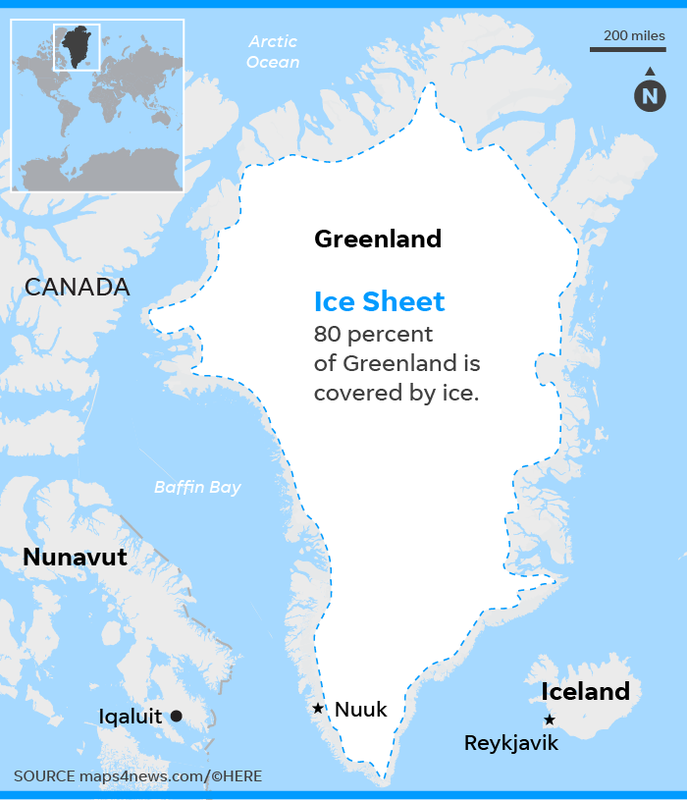 Jakobshavn Isbrae, the full name of the glacier along Western Greenland’s coast, has been Greenland’s fastest-flowing and largest ice-losing glacier over the past 20 years, making it by far the single largest contributor to sea level rise on the large, mostly frozen island. In fact, according to Khazendar, the melting from that single glacier alone contributed to global oceans rising an average of 1 millimeter between 2000 and 2010. And even though Jakobshavn has gained ice at lowest levels where it enters the sea, it has still been contributing to sea level rise because the rate it is melting into the ocean is still greater than the rate that ice is accumulating higher up on the glacier, according to the researchers. 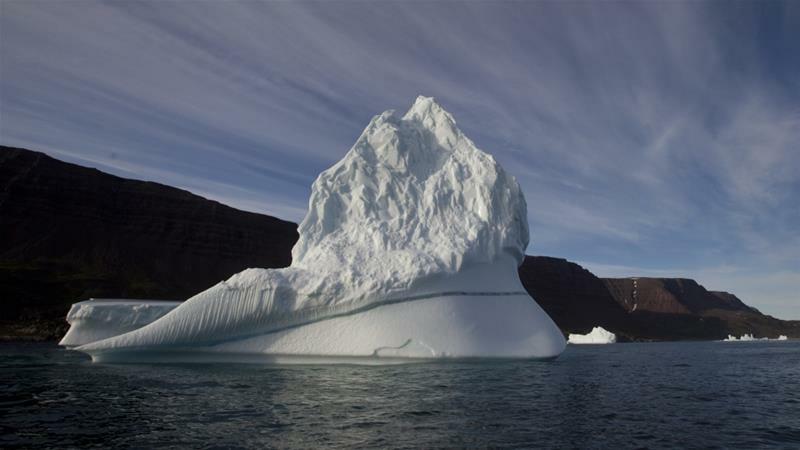 It is this threat, and the rapid speed with which Jakobshavn had been shredding ice over the past several decades, that has led droves of scientists to the icy coastline and makes the glacier one of, if not the most, studied glaciers in the world. Khazendar, along with a team of other scientists at NASA’s Jet Propulsion Laboratory, used a number of datasets from NASA that analyze Greenland’s ice, oceans and atmosphere, including those from recent targeted research missions called Oceans Melting Greenland and Operation Ice Bridge, to determine the likely cause of Jakobshavn’s recent about-face. 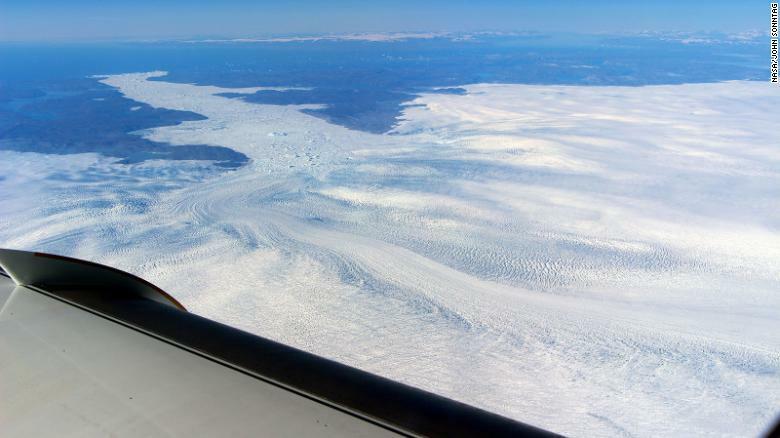 A view of the Jakobshavn Glacier from the window of a NASA research plane. Through detailed observations, Khazendar and team were able to track this cooler water from the open North Atlantic all the way to Disko Bay and found that the timing matched the glacier’s switch towards gaining ice perfectly. “In the last two or three years, the ocean’s role was dominant,” Khazendar said. The cooling of the Northern Atlantic is a blip on the radar, a localized effect that will eventually turn warmer as the North Atlantic Oscillation flips back. This will take place at the same time as climate change turns up the thermostat on earth’s oceans. “The response of a single glacier does not imply that things have shifted,” said Marco Tedesco, a research professor with Columbia University’s Lamont-Doherty Earth Observatory. 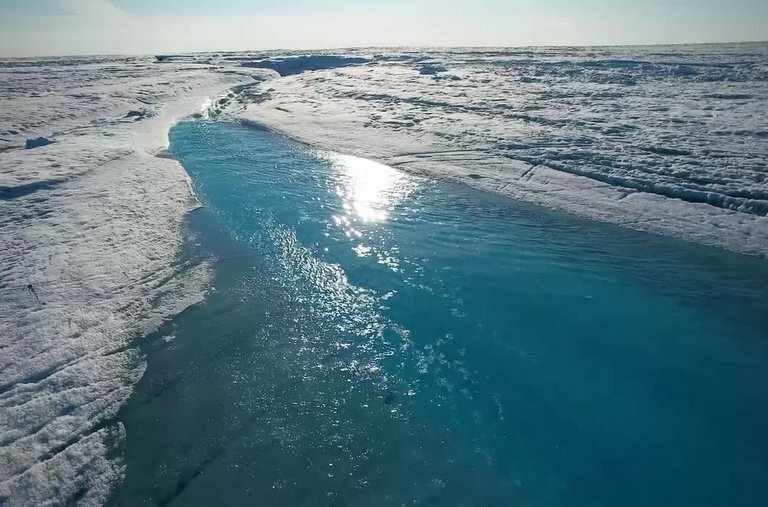 “Greenland is currently [losing] about 270 gigatons (a gigaton is a billion tons) of ice per year…its mass loss has been accelerating over the past decades, with Greenland being the single largest contributor to sea level rise,” Tedesco, who was not involved in the new research, wrote in an email. The findings show that glaciers are extremely vulnerable to temperatures, both hot and cold, and that is not good news for the future. Most of the heat from global warming is going straight into the oceans — studies show more than 90% — and that is resulting in global ocean heat levels that are climbing higher every year. The global weather is about to get worse. The melting polar ice sheets will mean rainfall and windstorms could become more violent, and hot spells and ice storms could become more extreme. Sea levels have already risen by about 14 cm in the last century: the worst scenarios have proposed a devastating rise of 130 cms by 2100. The fastest increase in the rise of sea levels is likely to happen between 2065 and 2075. At worst, there is a one in 20 chance that enough of Antarctica’s glacial burden will melt to raise sea levels by 39 cm. More likely, both studies conclude, under high levels of greenhouse gas concentrations, south polar ice will only melt to raise sea levels worldwide by about 15 cm. The study, published today in the journal Nature Communications [ open access ] <<https://www.nature.com/articles/s41467-019-08307-w>>, uses radiocarbon dating to determine the ages of plants collected at the edges of 30 ice caps on Baffin Island, west of Greenland. The island has experienced significant summertime warming in recent decades. You have 6 free articles remaining. John Schwartz is part of the climate team. Since joining The Times in 2000, he has covered science, law, technology, the space program and more, and has written for almost every section. People look out at the rough seas near to Durdle Door in Dorset, on December 15, 2018. The most recent gathering of scientists at the American Geophysical Union in Washington, DC, brought deeply troubling news about the Antarctic. Jeremy Shakun, a paleoclimatologist at Boston College, told Science that the large increase in the loss of ice mass in Antarctica in the last decade or two could already be the beginning stage of the process of collapse of the Western Antarctic Ice Sheet. Ice loss in the Antarctic has tripled in just the last decade alone, and is currently losing 219 billion metric tons of ice annually. That number is up from 73 billion metric tons per year as of a decade ago. “The big uptick in mass loss observed there in the past decade or two is perhaps the start of” the larger-scale collapse of the glaciers, Shakun told Science. If that is the case, the world must begin preparations immediately for sea levels that will rise far more abruptly than previously expected, with ocean waters rising as fast as 2.5 meters every one hundred years. The aforementioned discovery presented at the annual meeting of scientists also revealed that during the last brief warm period between Earth’s ice ages, which took place 125,000 years ago and when global temperatures were barely higher than they are today in our greenhouse-warmed planet, sea levels were six to nine meters (20 to 30 feet) higher than they are right now. That amount of sea level rise means that New York, Boston, Miami, Tampa, New Orleans, Jakarta, Singapore, Osaka, Tokyo, Mumbai, Kolkata, Dhaka and Ho Chi Minh City are among the many cities that will, sooner or later, have to be moved or abandoned entirely to the sea. Eastern Antarctica has always been seen as a place virtually impervious to melting, and has often been referred to as the “last bastion” of stable ice on the planet. However, recent data has shown that a group of glaciers covering 13 percent of the coastline of that side of the frozen continent are melting from below due to warming oceans. And disturbingly, 2017 was the hottest year on record for the oceans, and the fifth year in a row that oceans set a record for how warm they had become due to human-caused climate change. It is already known that the Western Antarctic Ice Sheet is experiencing serious retreat with a three-fold increase in acceleration having been reported in recent years. But NASA scientist Catherine Walker used measurements of ocean temperatures and computer modeling to show that the heat being delivered to certain glaciers in the Eastern Antarctic was coming from warming oceans. Given the remoteness of the Eastern part of Antarctica, it hasn’t been studied nearly as much as the rest of the Antarctic. Hence, since there is little data on it thus far, we should expect more bad news of melting as more studies are published on the region. The NASA data, coupled with the study mentioned at the American Geophysical Union, show that the speed of sea level rise from melting Antarctic glaciers is consistently increasing each year. At the current trajectory, 17.7 trillion metric tons of ice will be shed in the Antarctic by 2100. This assumes the current rate of loss will remain linear — an unrealistic assumption given that the rate is increasing annually. The Arctic report, in its 13th edition, explains changes, impacts of melting on the ecosystem & marine life. During the latest period studied, October 2017 through September 2018, annual average temperature in the Arctic was 3.1 Fahrenheit (1.7 Celsius) higher than the 1981–2010 average. Last year, old ice made up less than one percent of the ice pack. Over the past 33 years, very old Arctic ice has declined by 95 percent. 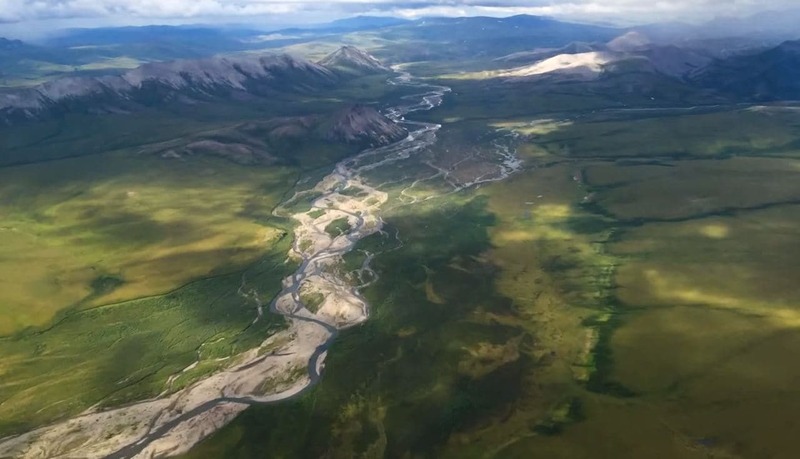 Even though melting ice has freed up more land for grazing, herds of caribou and wild reindeer across the Arctic tundra have declined by 56 percent over the last two decades, cutting populations from 4.7 million to 2.1 million. “This pollution — from plastics produced and discarded in more populated areas of the world — is likely traveling with ocean currents to the Arctic,” said Karen Frey, professor of geography at Clark University. “From a historical perspective, today’s melt rates are off the charts, and this study provides the evidence to prove this” said co-author Sarah Das, a glaciologist at the Woods Hole Oceanographic Institution. According to the journal Nature, in just one year (2012), enough ice melted into water to fill up some 240 million Olympic swimming pools.